The Eagles are movin' on up, barely. Eagles playoff scenarios: How can they win the NFC East? Earn Wild Card berth? We're No. 1 in: Slow starts. The Eagles have been blanked nine times in the first quarters of their 12 games. They've scored 28 points in the first quarter all season. #JimmySays: The Eagles scored on their first possession against the Giants, but it was called back on a hold, and then they had a bogus offensive pass interference called on them to end a drive. Against the Redskins, the Eagles scored on their opening drive. So maybe we're seeing those early-game struggles begin to fade? Anyway, 17th is too low. The Eagles should be ahead of teams like the Panthers and Broncos. The defending champs are relevant again, toppling the Redskins en route to Sunday's showdown in Big D for first place in the NFC East. JerryWorld has been kind to the visitors from the Northeast this decade: Philadelphia won there last year, lost in overtime the season prior and won in OT the year before that. They also prevailed on Turkey Day 2014, and won the division over Neckbeard and the Cowboys in the last regular-season game of 2013. The Andy Reid Eagles also won two out of three in Dallas back in 2010-2012. So Doug Pederson's version won't be scared. If the Eagles are to take down Dallas again, they must run the football effectively early, which was a problem again Monday night (though they picked it up late). Stopping the run was problematic for Philly the last time it faced the 'Boys, as Ezekiel Elliott scurried all over the place in Week 10. Gotta love this matchup, with all the juice it carries. #JimmySays: Indeed there will be juice. They looked like a playoff contender against the Redskins. But they must beat the Cowboys this week to have a chance. They face a brutal finish, starting in Dallas. But it appears offense finally coming together as Josh Adams, Golden Tate integrate. #JimmySays: Dallas is hardly a "brutal" opponent. The Rams certainly are, and maybe the Texans. #JimmySays: Yep, the Eagles' work isn't even close to being done even if they beat Dallas on Sunday. The win Monday night over the Redskins means that the Eagles still have possibilities for the remainder of their season. 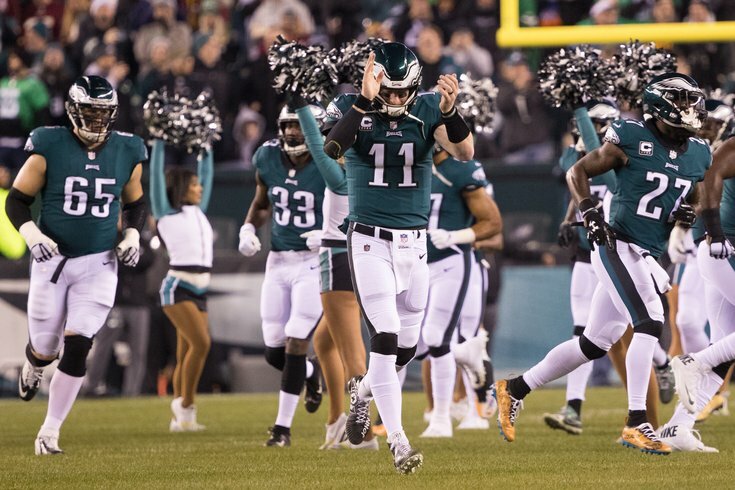 But their performance was not all that sharp, at least not for the first three quarters, and left tackle Jason Peters limping off the field in the final minutes was not a welcome sight. #JimmySays: JP is fine, per Doug.